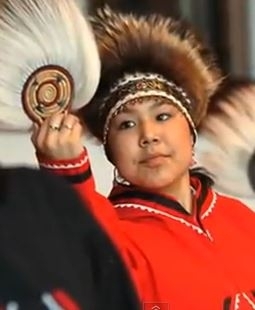 The Tanana are a Athapaskans Native American people who originally resided along the Tanana River in east-central Alaska interior. According to the Alaska Native Language Center, the "Tanana Athabascan is now spoken only at Nenana and Minto on the Tanana River below Fairbanks. The Athabascan population of those two villages is about 380, of whom about 30, the youngest approaching age 60, speak the language." Christian missionaries of the Episcopal church established churches and missions in the area beginning in the early 1900s. Several members of Tanana society, including one woman, have become ordained ministers of the Episcopal church. However, many traditional beliefs persist and are evident in rituals surrounding death. The most important religious ceremonies continue to be potlatches, particularly the Funeral and memorial types. Both the ceremony following the death of an individual and the potlatch serve as a memorial and are central to religious, social, and economic life. Pray God will send Christians to locations where the Tanana reside in order to form genuine Christian friendships with them. Pray God will work in the hearts and minds via dreams and other means to reveal that God's free gift of grace is found in Jesus Christ.